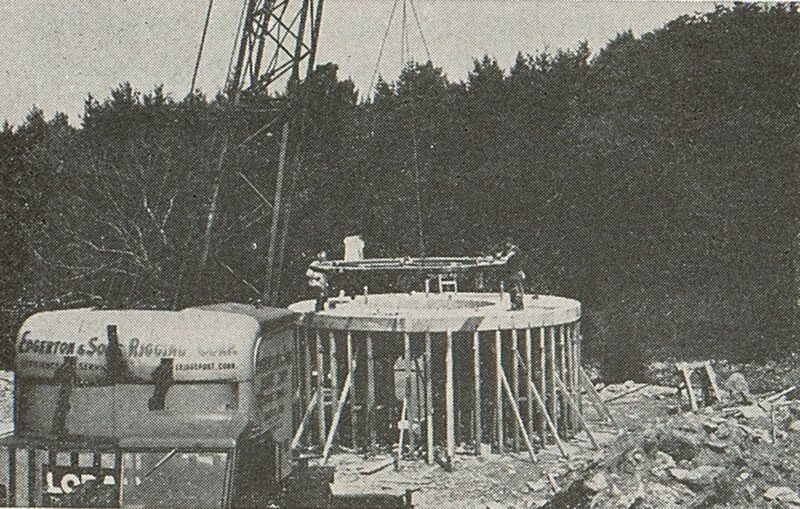 The 131/2-ft-diameter ball bearing is positioned on top of the concrete pedestal. Rotating Residence pivots on a bearing 13 ft above the ground to turn any given room to any point of the compass. When a wall switch is operated, the 71-ft diam house revolves clockwise or counterclockwise at a speed from 5 to 40 revolutions per day, allowing its occupants to select the view that is most pleasant at the moment. Designed by New York architect Richard Foster, the circular house is supported by a wire-race ball bearing, designed and built by Rotek Inc., mounted on top of a stationary pedestal. Access to the house is through the pedestal—approximately 10 feett in diameter and containing a 20-riser spiral staircase. Power is derived from a 11/2-hp electric motor; torque for rotation is transmitted from a pinion on the output shaft of the drive to an external gear on the bearing. Life of the 131/2-ft-diam bearing is estimated at several decades. The balls ride on contoured wire raceways which can be replaced by jack-ing the house off the pedestal. Provision for jacking points has been included in the design of the structure. Thrust loads up to 5 million lb can be accommodated by the bearing, although weight of the rotating portion of the house will not exceed 1/2 million lb. Main row of balls carries thrust and incidental radial loads while the locking row pro-vides high moment and radial capacity to with-stand hurricane-force winds to 125 mph. Lines for water, telephone, and electricity enter the house through a central shaft within the stairwell and are distributed to the revolving areas through a valve that’s free to pivot as the house turns, a commutator, and a trolley. A lead-lined concrete trough disposes of waste material. The circular trough is located in the pedestal and waste material is flushed into the trough through a sealed cap which rotates with the house. The seal is maintained during rotation by vertical baffles which project from the revolving cap down into small water-filled troughs on the inner and outer lips of the large trough. Four 4-in. drains connect trough with sanitary system.